This page is dedicated to those odds and ends of WW-II clandestine daggers, including lapel daggers, thumb daggers, "commando nails", "hatpins," etc that don't really fit elsewhere. 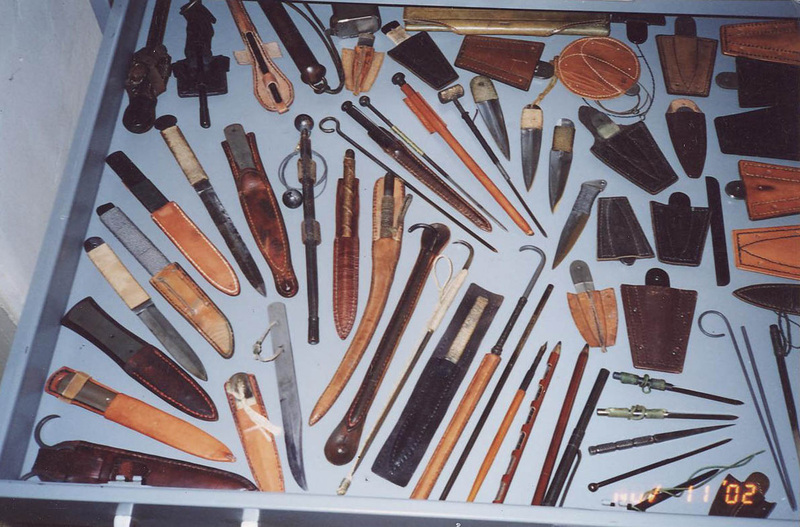 Illustrated here are some examples of the knives specific to this genre'. 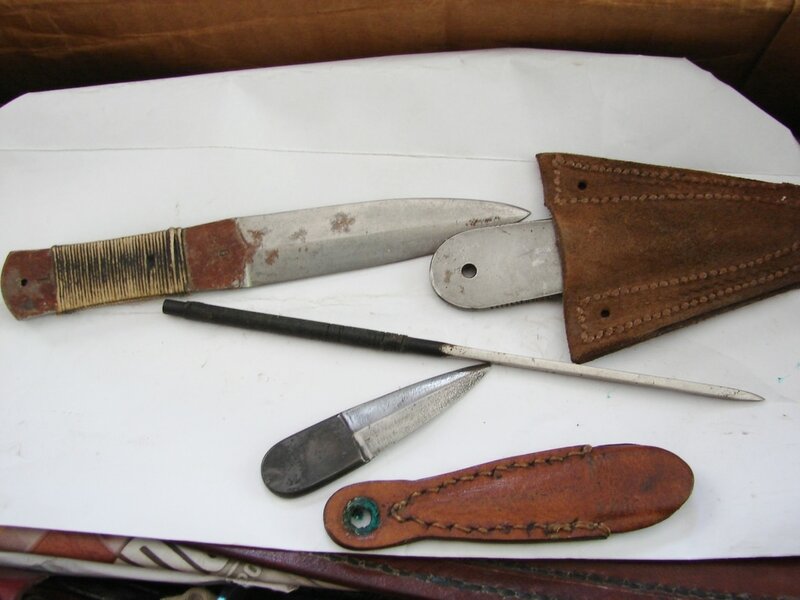 These were obviously weapons of last resort, even more so than the mini-Fairbairn knives. There is a certain allure to these tiny daggers that conjures up images of James Bond type exploits in a world gone mad for war. These were issued by the S.O.E. to men and women training in such mysterious and romantic sounding places as Camp-X (also known as STS103) in Canada, Arisaig, Beaulieu House, and Inverailort, Scotland in the methods of sabotage and silent killing. Below: Here is a small sampling of WW-II S.O.E. weapons from a friend and donor to our website. Yes these were all donated by a man from his personal collection of clandestine weapons. His generosity is astounding! He also donated the wood handled Third Pattern style X-dagger last year. To say I was speechless as I pulled item after item from the box he mailed me, is the understatement of the century. Below: This commando nail is NOT WW-II but it is so unique I wanted to share it with you anyway. 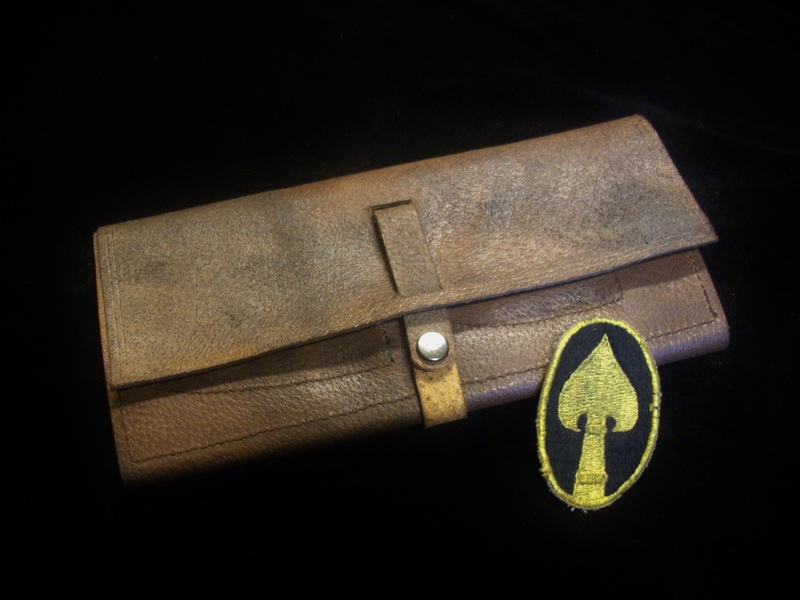 It was custom made by a man working under the company name of "Cloak & Dagger." The skull was meticulously sculpted by his partner Xylon Cate. 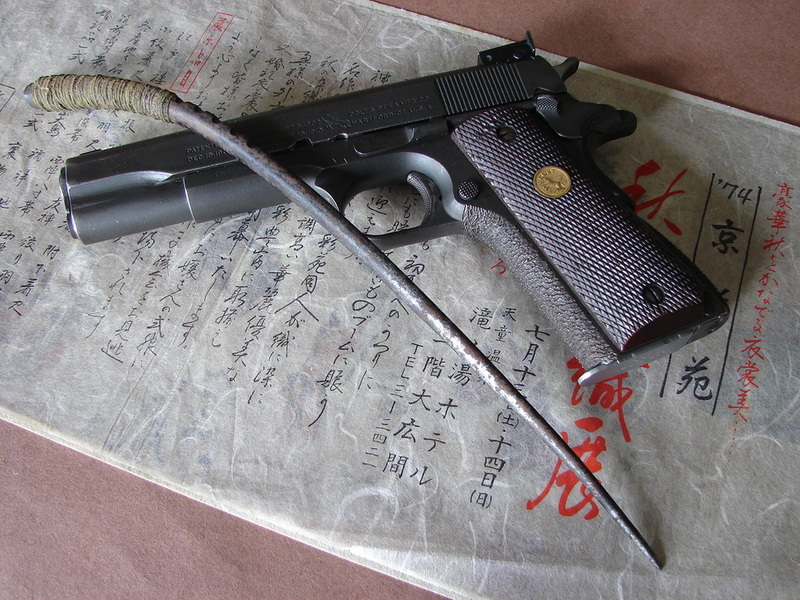 This is a very deadly SOE type weapon. The blade is three sided and the overall length of the knife is 8 1/2 inches. 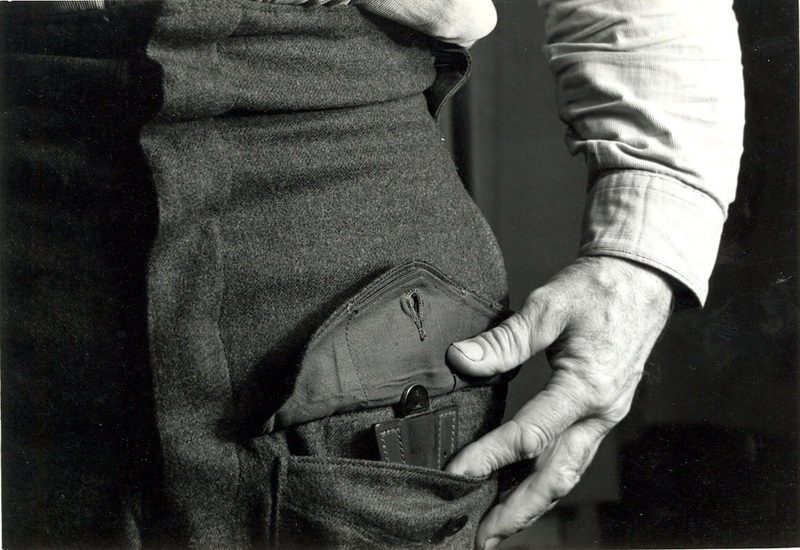 It can be held either in a fencing grip or a push-dagger grip. An awesome little weapon! I anxiously look forward to their next offerings. 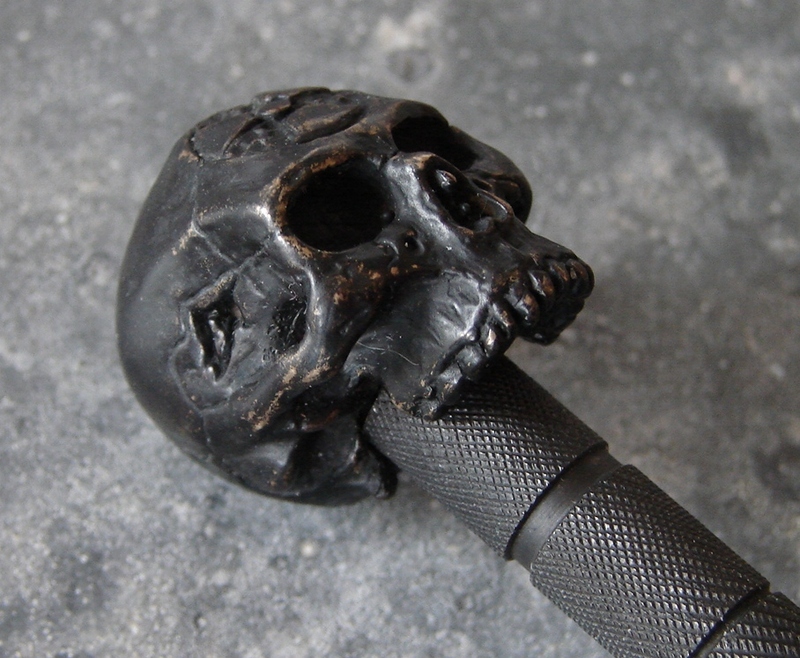 The skull rests comfortably in the hollow of your palm absorbing any force from a stab. Below: Here is another tiny lapel dagger with arm type sheath. The dagger is marked in several locations. This knife is under 6 inches overall. On the one side it is stamped with a broad arrow that is approximately 1 mm tall. I would love to know who made these tiny stamps. Up by the blade it is stamped "A&P." There is one final stamping on the opposite side that has been poorly chiseled out. I know what it says but I am not saying at this time. The entire knife has some sort of grey phosphate finish or something of that sort. The leather sheath is well made and tightly fitted to the knife. Below: Incredibly rare Insole Dagger. These tiny daggers are curved to fit the arch of the Agent's foot. It slides into the pocked sewn into the leather insole and is retrieved by pulling on the string. This one is marked "J.P" for, yes John Paisley. It has several other stamps including the British Broad Arrow acceptance mark. 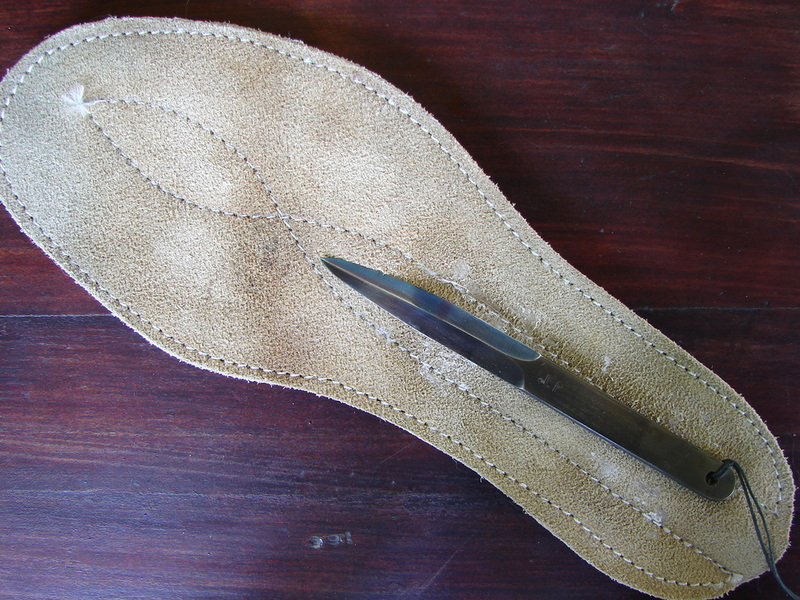 The insole is about a size 9 1/2 for gauging the size of the dagger. It has a beautiful heat blued finish. 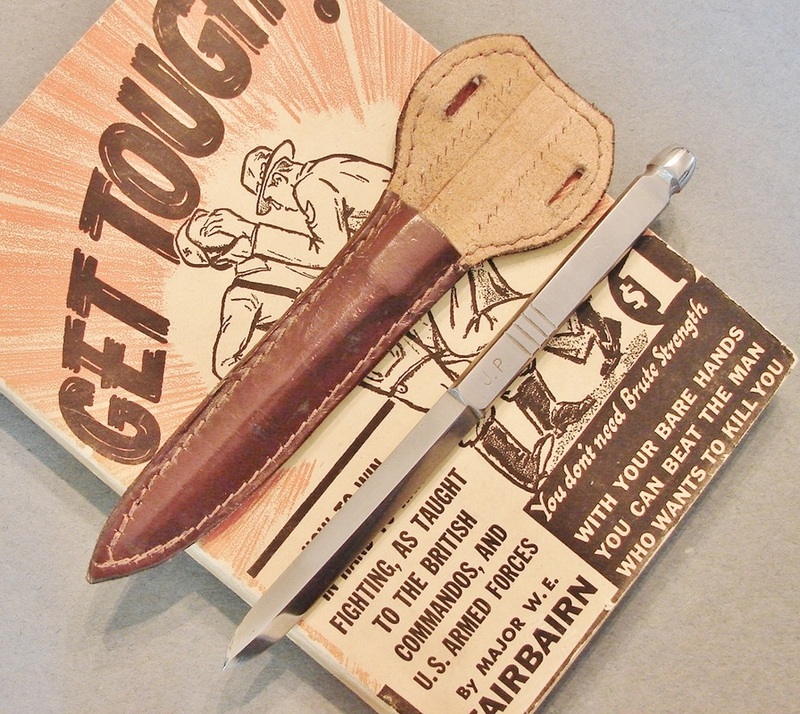 Below: An excellent condition thumb dagger from Canada. 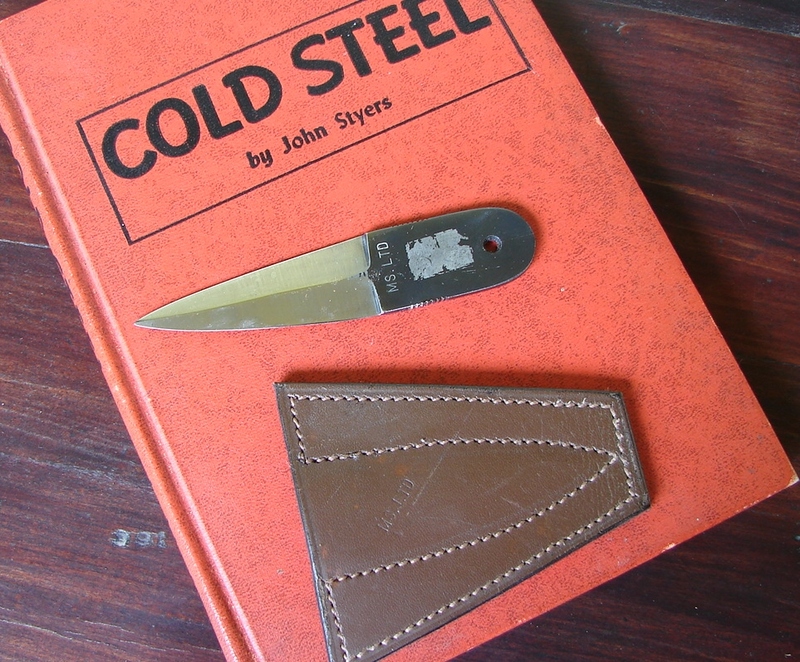 It was made by Metal Stamping Ltd and is marked "MS Ltd." The heavy leather sheath is similarly marked. The bright spot appears to be where someone scraped off a sticker of a Canadian flag or Maple leaf, along with the finish! Below: An unusual neck dagger of very small proportions. It is in its original sheath with cord for hanging around the neck. The handle has its original black cord wrapping. 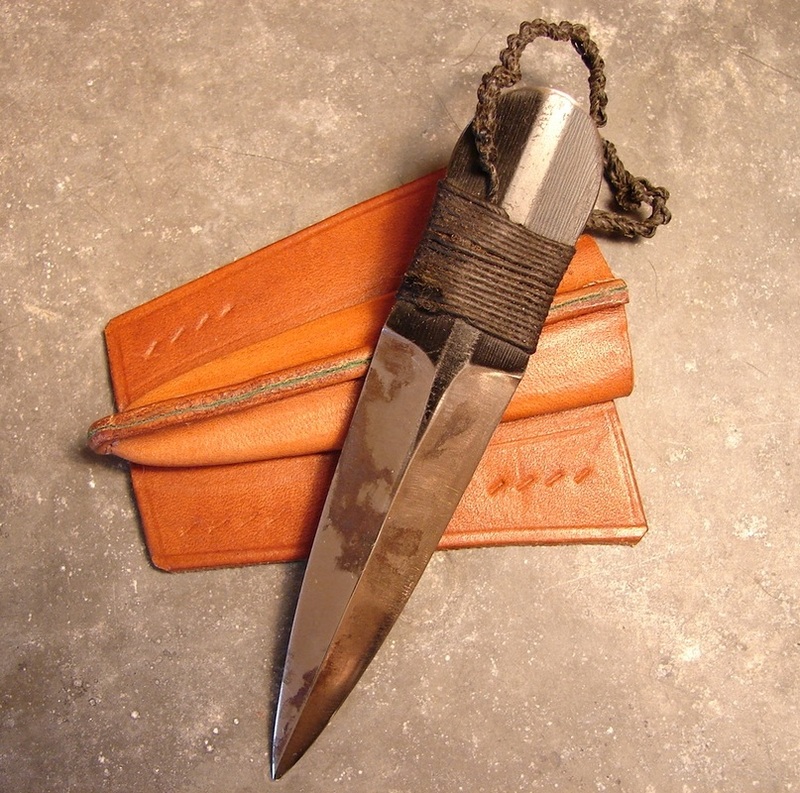 I have seen an identical dagger fitted to the front of an X-dagger sheath in a sewn on pouch. Despite its size it might just afford you enough surprise to cut and run, if stopped by German forces. Below: If you look in the photo of the major collection of SOE and OSS weapons you will find another one of these "Tine" daggers. They were made from the tines of a pitchfork. Incredibly primitive, but effective and cheap. This one is quite curved but it fits the hand perfectly. A twine wrapping provides a better grip, and the thumb notches are helpful in orienting the weapon in one's hand. It is the same length as a First Pattern FS. The sheath for this one had rotted away but I presume it would be very similar to the one in my friend's collection. It is thought these might have been made in India. The 1911 Colt is mine and was manufactured in 1918. To the left: This is a page from the book on Clandestine weapons by Kieth Melton with input from Capt. Peter Mason SAS. 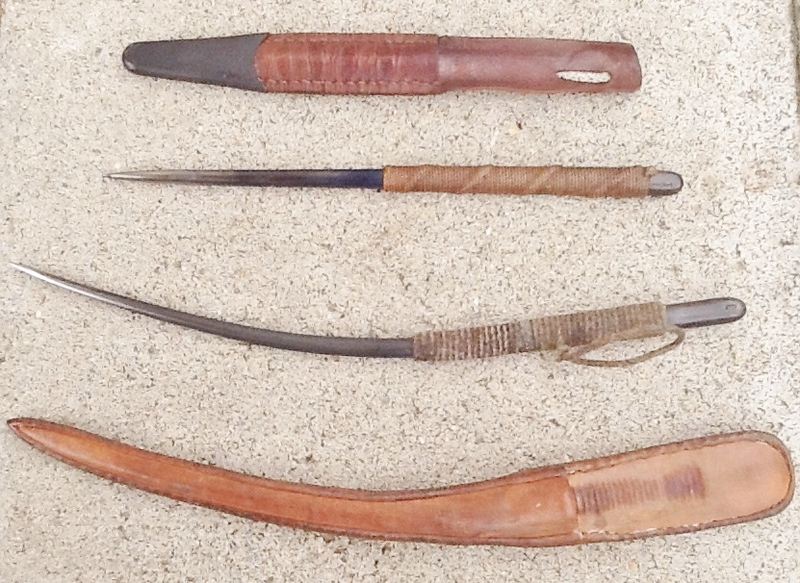 Below: These next two photos illustrate an incredible collection of some of the rarest weapons of WW-II. Included are nails, brochettes, thumb daggers, agent's daggers, hat pins, and garrotes. A veritable smorgasbord of miniature mayhem. My thanks to the owner for his use of these photos. Alas, this is not my collection. Many of these have now become mine through the generous gifting of the owner! Right: This is perhaps the most important thumb dagger in our collection. Why is it important at all? It is made from an 1888 or 1903 Bayonet tip. Why is that important? It is important because these are not uncommon and they were made from "scrap." 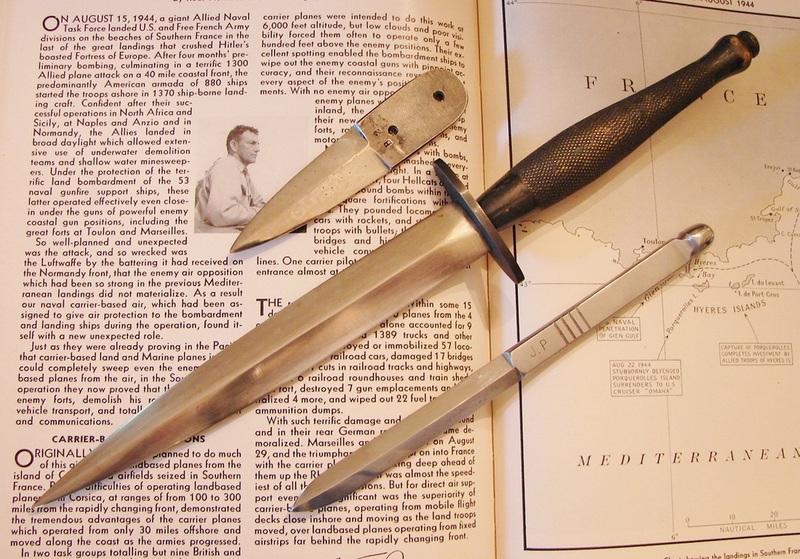 The major portion of the bayonet blade was used to make fighting knives, the cut off tips ended up as thumb daggers. 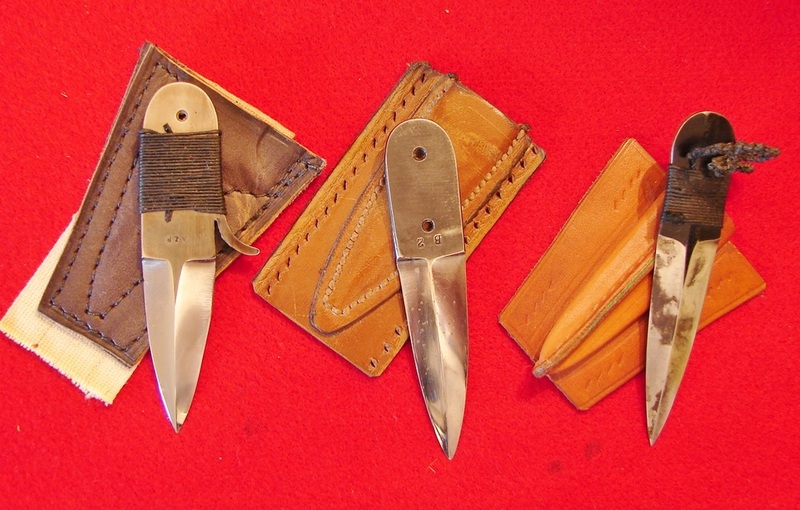 The fighting knives were the X-daggers which have their own section here on our website. 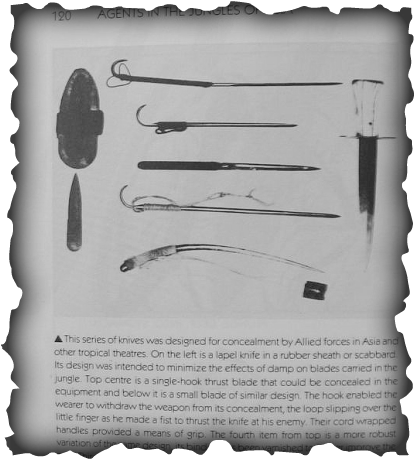 X-daggers are also the controversial knives which some say bayonet blades were not suitable, or sensible, for converting into fighting knives. You can rest assured they did not whack off the bayonet tips to make these little daggers and throw the rest of the bayonet away. The knife's handle portion is cord wrapped, including a finger loop, to give the user a more secure grip. The sheath could be sewn into a pocket or hidden under a coat lapel. This knife is particularly sharp and could inflict serious cuts. When these cuts were directed to the appropriate areas a lot of bleeding could be the result and the person so attacked would be more concerned about seeking immediate medical attention for their injuries than restraining some surly ersatz peasant (covert operator). Below: Here is where one could wear their thumb dagger to keep it secure and concealed. Below: A nice selection of commando "Nails." Nice stuff from the SOE with a wide variety of blades. Again these are not my pieces. Below: They say that "necessity is the mother of invention." 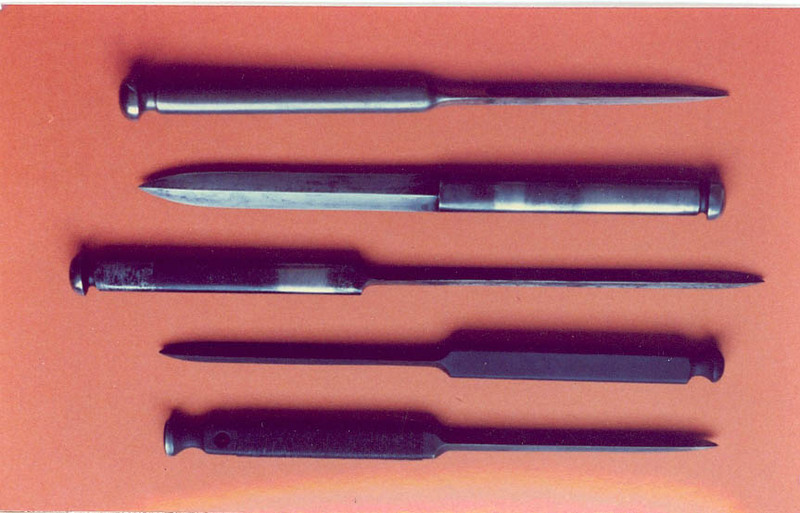 A couple of particularly nasty needle-like weapons as used by the SOE and OSS. The handles are cord wrapped to provide a gripping surface. Without a sheath, these could be easily hidden in the seam of one's clothing or boot and used for stabbing or raking attacks. The lower one is now part of our collection and was made from a pitchfork tine. It is stamped "I" for Ishapur, India. surrounding clandestine units and their weapons. It might be a good topic to discuss over a tall glass of Guinness Stout. 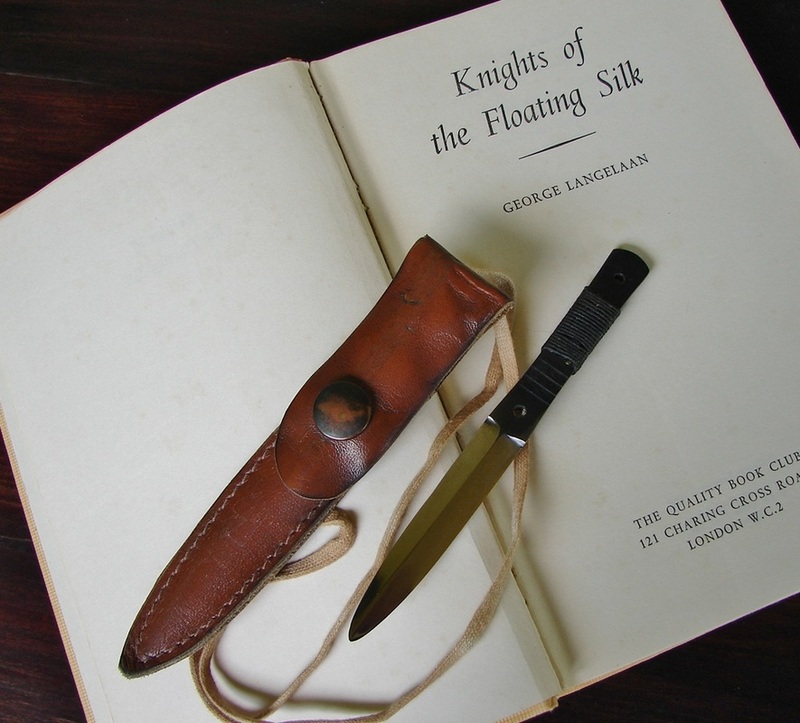 Below: This thumb dagger is in excellent condition and came fitted in this typical leather sheath. It is ground with four bevels, made from a 4 inch piece of steel. A nicely made little dagger. space between the two characters. 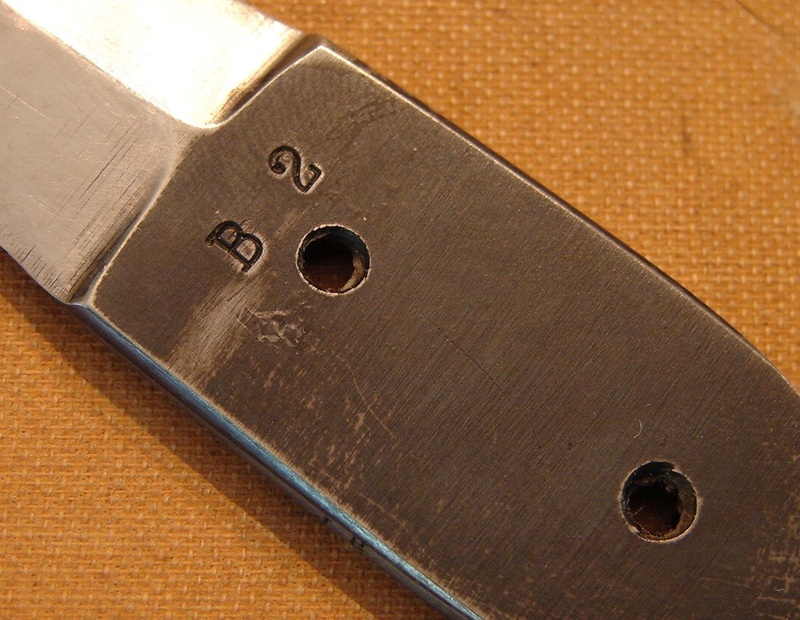 Commando knives marked "B 2" are Wilkinson made. Is there any connection? 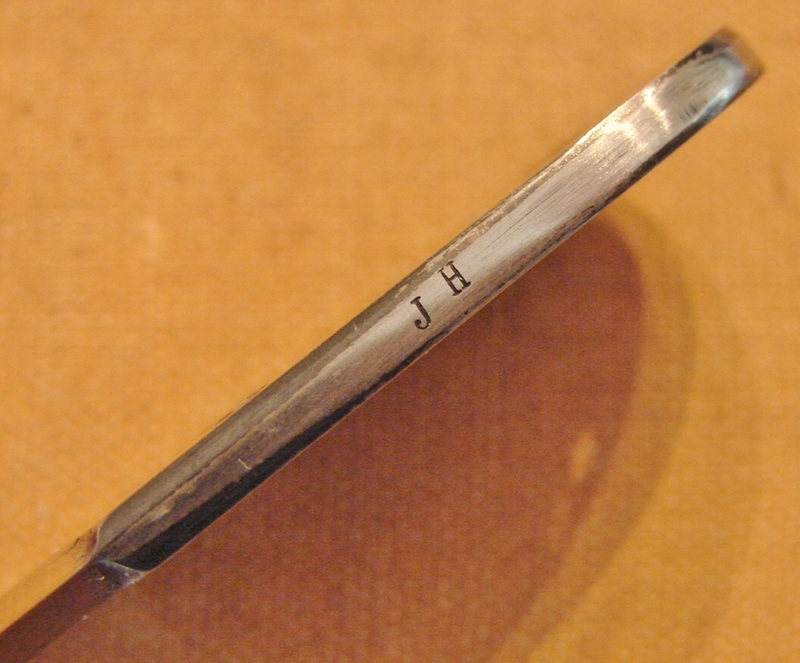 Below: One edge of the handle portion is stamped "J H" which is most likely the owner's or maker's initials. It would be exciting to think that maybe it belonged to the elusive Johannes Happe. Compared to the reproduction thumb dagger I have from H.G. Long these two are larger and big enough to be serious weapons. They are both well sharpened. Below: Called "The Hand of Fatima," this is a very unique thumb dagger. According to Leroy Thompson the name comes from the thumb-like protrusion which makes the dagger resemble the mystical protective sign known in Islam as The Hand of Fatima," or "The Hand of Mary" if you are a Christian. It has a fine cord wrapping on the handle for a better grip. Below: One example of the mystical "Hand of Fatima" symbol. Below: Sure to raise eyebrows, this knife is stamped "A&P" for Alcock and Pearce of Australia. 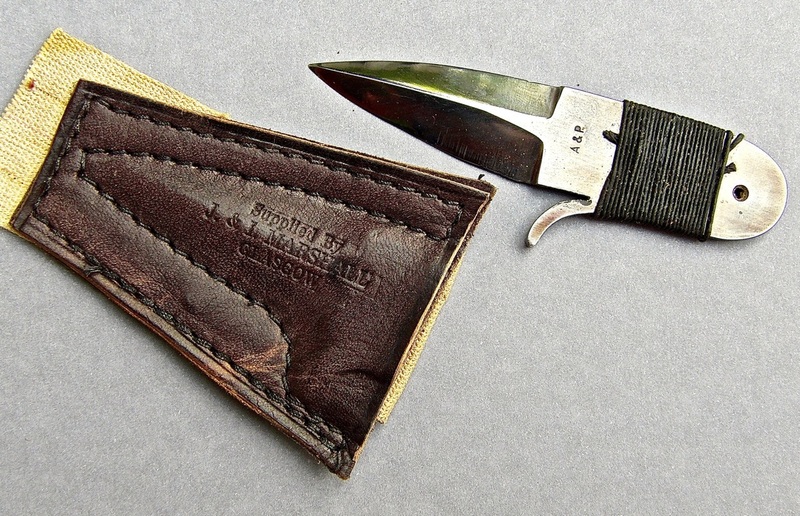 The leather sheath was clearly made for this knife to accept the "thumb." 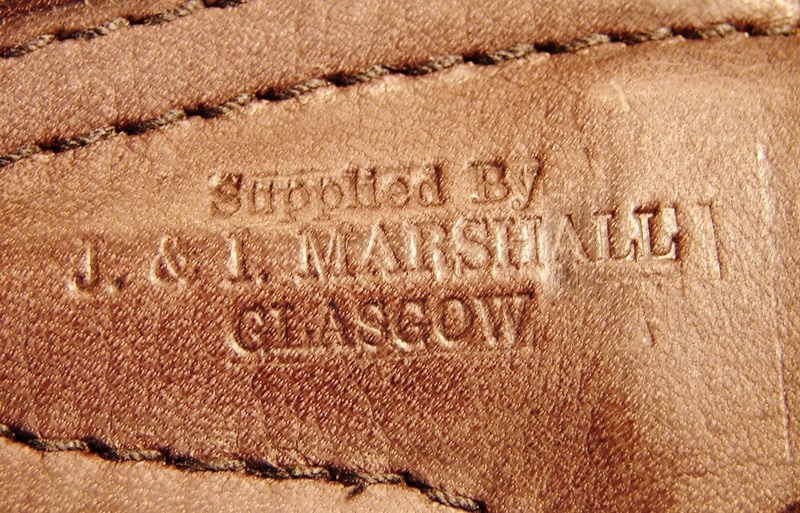 It is stamped "Supplied By, J & I Marshall , Glasgow." I suspect the knives were made and shipped by A & P to Scotland (maybe for the SOE) and some chap either had a bunch of them sheathed, or perhaps just his own personal knife. Below: Next is a splendid example of a sleeve dagger. The blade cross-section is a diamond with four sides unlike many of the reproductions by H.G. Long etc with triangular blades. The handle has several cross filed grooves to assist in weapon retention/orientation. It is clearly stamped with the initials "J.P" I will let you draw your own conclusions as to their meaning. 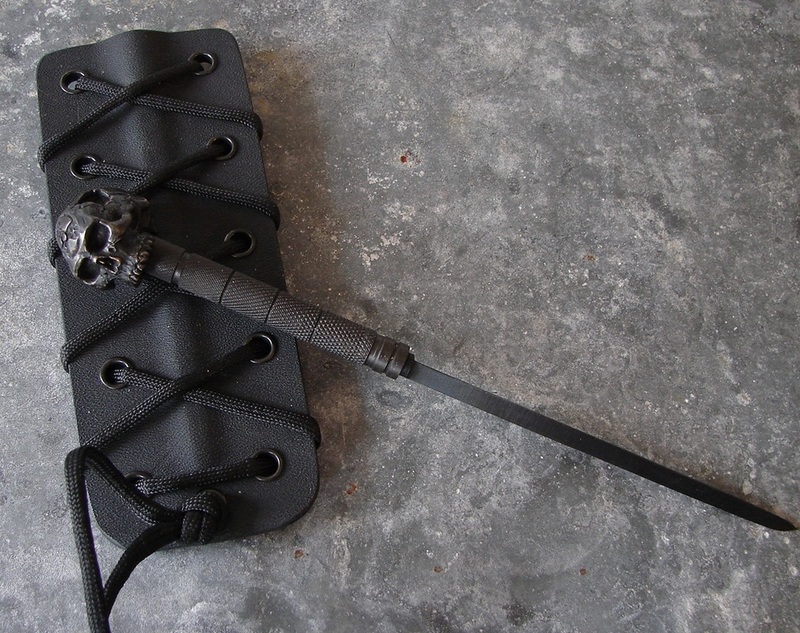 The sheath is a fine grade of leather missing its arm strap. 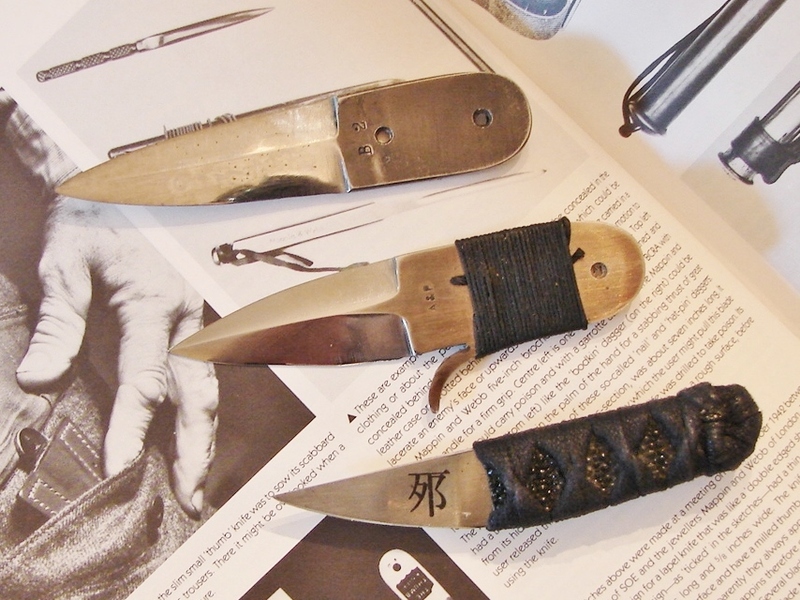 Below: Here are the two WW-II thumb daggers and a tiny Shobu knife made by Gary Bradburn of Wichita, KS. Of the hundreds of knives I own, this little shobu knife may be the one I have used the most. 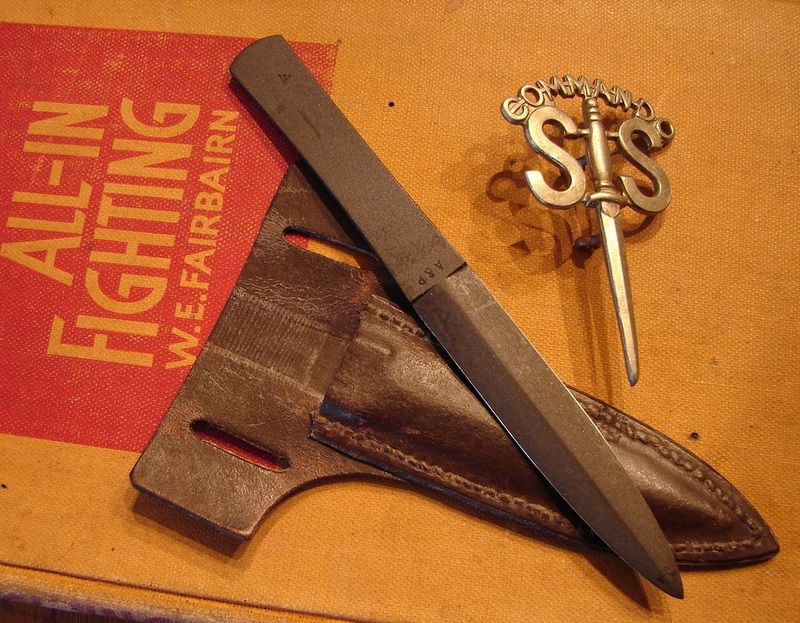 Below: this photo gives a size comparison between the full size Fairbairn-Sykes marked with the "X" on its guard and the two clandestine knives. 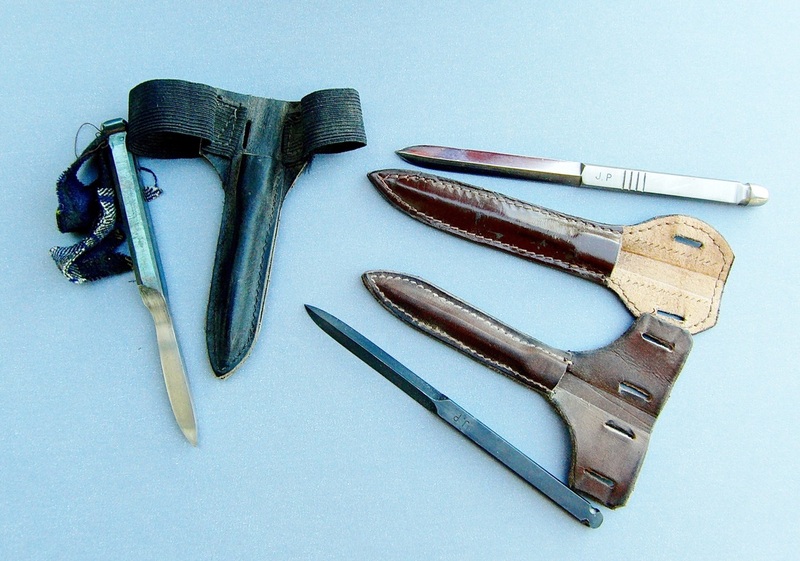 Below: The thumb dagger on the far left is the A & P "Hand of Fatima, Center is the B-2 attributed to Sanderson manufacturing (by some), the one on the right is unmarked and was crafted from the tip of a bayonet (perhaps a model 1888). This one does not appear to have ever been sewn into any clothing and is perhaps completely unused. It is quite sharp and retains its original cord wrapping and finger loop. The grinds are not quite centered on this one but it is still finely ground and highly polished. Below: Here is an image that has been floating about for many years. I do not know whom to properly credit but if someone knows I will be glad to do so. I think I first saw it in the back of one of Wm. Windrums books. 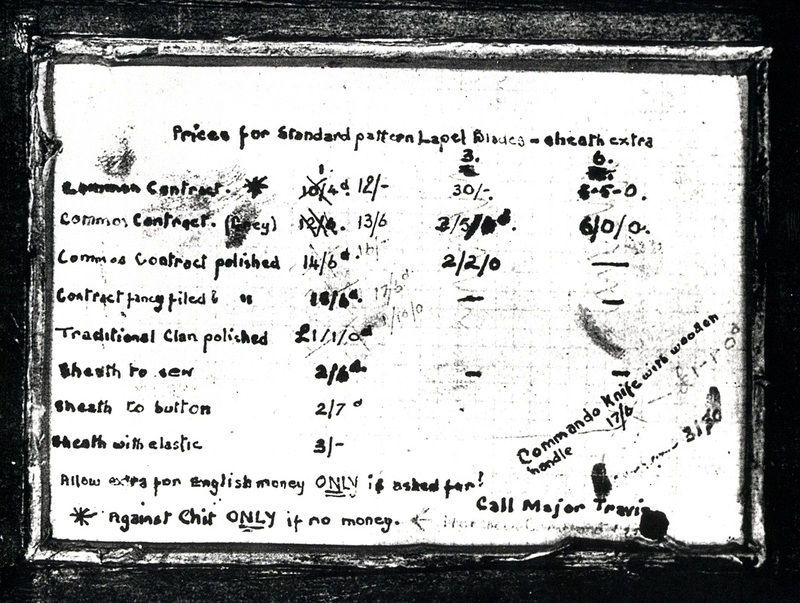 It is a price sheet posted in the back of a picture frame/display case for Lapel daggers. 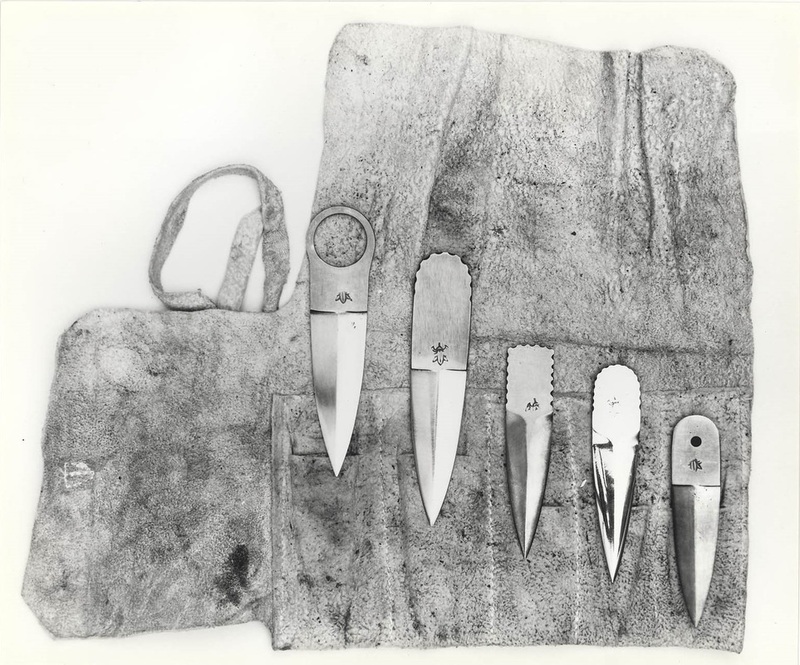 Note that the sheath was priced separately meaning that some of the knives might have been purchased without sheaths and carried that way. There is also an interesting side note about "commando knife with wood handle" which ought to put to rest the question of whether they were war-time or not. Here is another older photographic image that was given to me. It shows what is described as Lames Revers (blade-lapel or sleeve) made by John Paisley and Son, Glasgow. I do not know the provenance of the original of this photo. If you have that information please pass it on to me so we can properly credit the owner. It might also help locate the location of the knives at the time of the photo. The daggers have a strange stylized flower (Tulip?) engraved on them that some say is a Paisley clan emblem. Note the one on the far right has crosshatching on the handle to replicate the interweave carving found on Scottish dirks and sgian dubh. This is an exceptional thumb dagger! Eureka, I think I now know what the symbol actually represents! It seems incredibly obvious now. 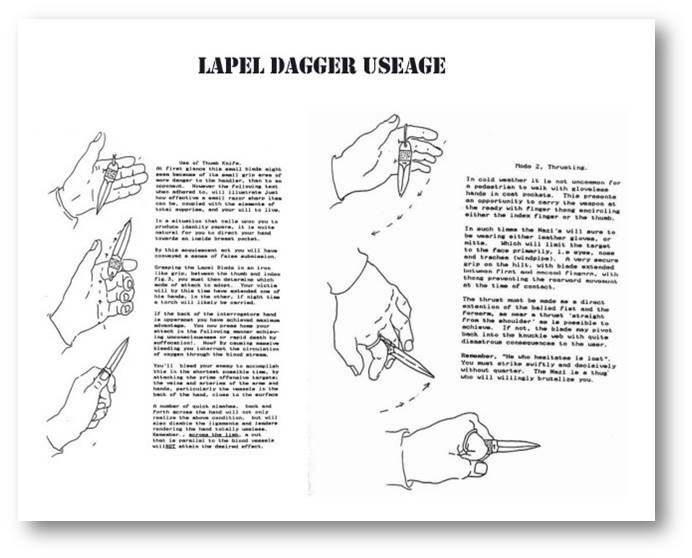 Below: I apologize but I cannot seem to find the source of this instruction sheet on the use of Lapel/Thumb Daggers. If anyone knows the source please contact me so I can give proper credit. It is found in Capt. Mason's autobiography but I do not know if he is the original source. A letter has come into my possession that verifies this was drawn by Mason. 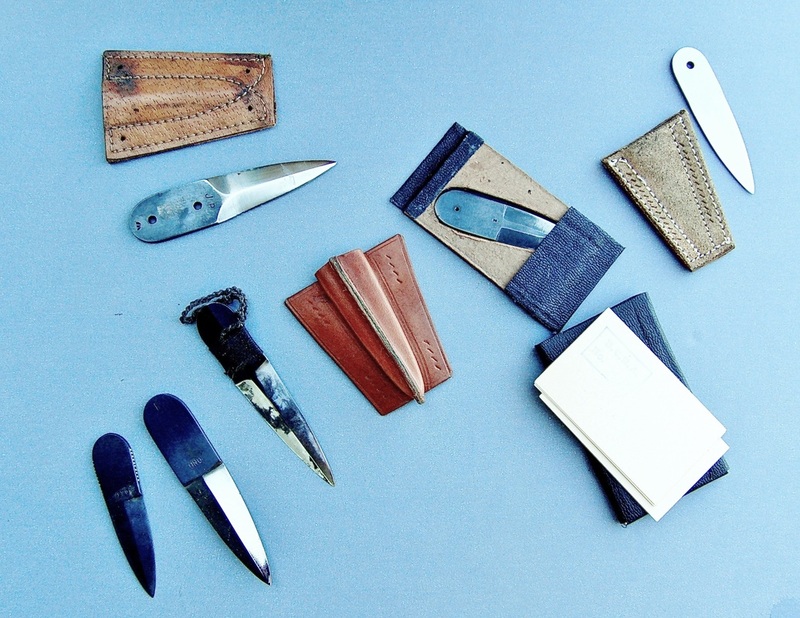 Below: A great photo of a wallet set up for thumb daggers. I am not sure if this was intended as an instructor's set or perhaps a manufacturer's sampler. 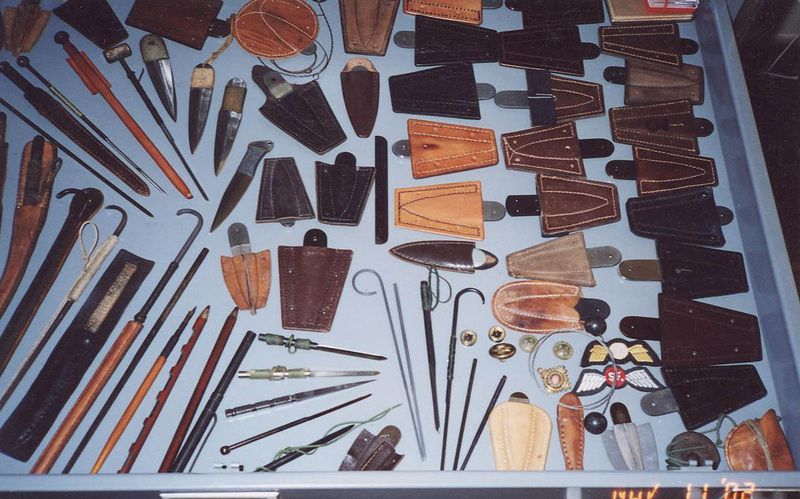 Whatever its purpose it is a superb selection of thumb daggers. The unusual markings may be John Paisley's "flower" stamp. In this instance the symbol appears more like a Fleur d' Lis. It is an enigmatic image for sure. 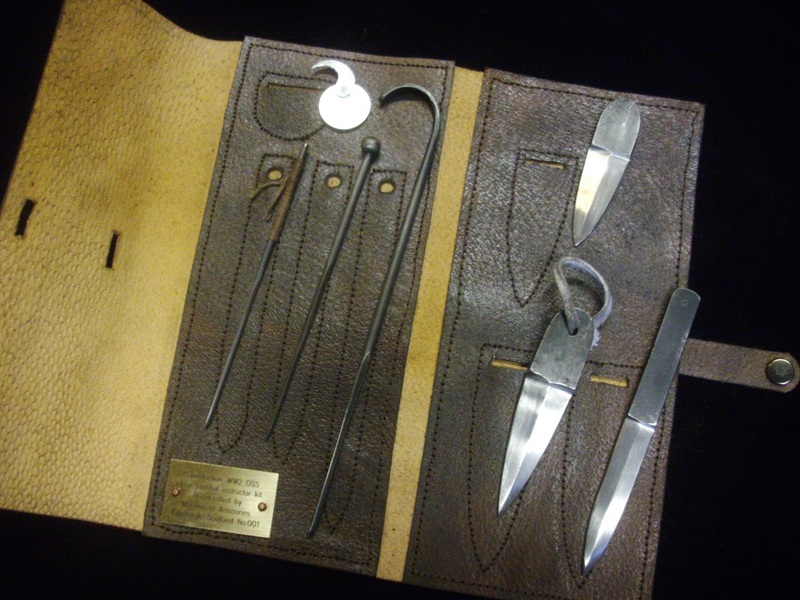 Below: A beautiful recreation of an SOE Instructor's set of covert weapons made by Maestro Paul at MacDonald's Armoury, Edinburgh Scotland. Oh yes I am on his waiting list to purchase a set, you can be sure of that! Great job Paul!